Welcome to LottoDay! the next platform in our lottery online review series. The platform top-notch design will welcomes you with great functionalities and colors. LottoDay is fully responsive and will allows you to buy online lottery tickets from any device, including desktop, tablets and smartphones. Consequently, you will be able to buy lottery raffles from the major lotteries around the world from your location. The company is based in Gibraltar while the company offices are based in Bulgaria. Check out all the aspects of LottoDay at our review to get a complete picture of the brand. We check all the security measures provided by the brand. How the site is developed and what is offer in name of user experience. LottoDay.com site runs with HTTPS secure protocol and owns Comodo SSL certificate. This certification warrants that all the transactions in the site are SSL 128bit encrypted. The site is not regulated by any gambling authority, but still you must remember that they actually act as lottery ticket purchasing service. Therefore, they are intermediaries between the customer and the official lotteries agents. Consequently, your purchase is secure and safe. Anyway, we think that if LottoDay obtains a legal license will optimize its services. 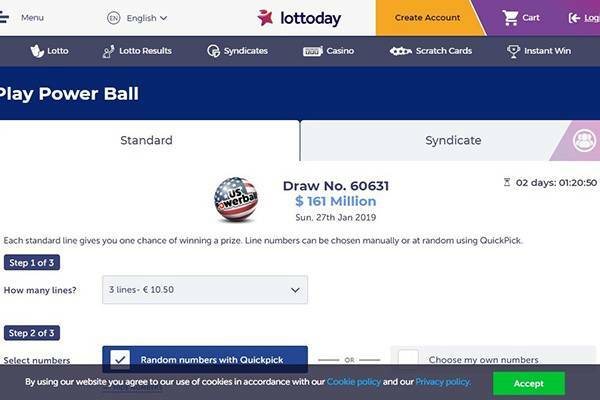 Lottoday.com offers the major loteries from Europe, USA and Australia. This means that you will be able to buy lottery tickets and take part of the raffles. This lotteries has the major jackpots you can imagine, reaching hundreds of millions. For example, US PowerBall lottery normally offers jackpots over $200,000,000! The available lotteries at LottoDay are: USA PowerBall, MegaMillions, Euro Millions, SuperEnalotto, UK Lotto, Euro Jackpot, El Gordo, OZ Lotto and Australian PowerBall. Furthermore, group play is available for: PowerBall US, MegaMillions and SuperEnalotto. With this feature you will be able to buy with a group of people a ticket, increasing your chances to win (by decreasing the price of the ticket and allowing you to take part of more tickets). Obviously, the prize will be share in this mode with the group. The only feature that LottoDay is currently offering is the group play mode. Normally called syndicate, this mode maximize your odds by allowing you to buy 50 tickets as part of a group. By this way, the cost of each ticket is share by the group, and also the winnings. You will find at the site a very nice video showing how the syndicate mode works, so if you have any doubt, watch it. The site supports only four languages: English, Spanish, Russian and German. Comparing this quantity of languages with other platforms we review we must say is very scarce. LottoDay.com stronger point is its design and easy navigation. We find the site platform really simple to any kind of users, no matter how much is your technological knowledge. The site is fully adapted for desktop and mobile devices. You will get the full experience with you computer, tablet or smart phone. There is no special view for tablets. 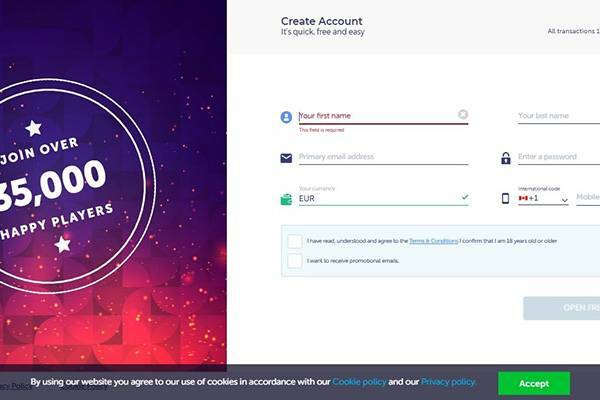 In case you are navigating from your personal computer you will get a special site for it, in addition, if you are playing from your smart phone you will get automatically redirect to a special site for mobile devices. You will not even notice it, because the site detects your device and serves you accordingly. The desktop site is well developed and an excellent user experience is guaranteed. You will get an exclusive mobile site, serve with user-agent detection redirect. This means, you will land at the mobile site automatically. All functionalities and gaming options are available both for Android and iPhone. LottoDay is not currently offering any offer for new player. This lack of welcome bonus or discounts is something the platform needs to improve. Anyway, for existing customers, you will have the possibility to join the VIP Club. The most loyal customer will get a personal account manager, big discounts on tickets, exclusive offer, special promotions, reminders for big draws and a dedicated phone number for customer support. We hope that Lotto Day will promptly offer promotions for new users in order to enrich their experience. One of the most important services an online platform must offer is the customer support. Quality in service and time availability are the key factors in this area. The lines are available from Monday to Friday between 10am and 17pm GMT. You will find a form at the contact us section of the site to directly send a message to customer support department. If you get until this point of the review, you will want to know the answer to a very important question: is LottoDay legit or is scam? Whenever you are ready to make an online transaction you need to ask this question, is really important to be secure about any monetary action on the web. Lottoday.com is 128bit SSL encrypted for all the transactions, and even they lacked a gambling authority licensed, they are a legit platform to buy online lottery tickets. 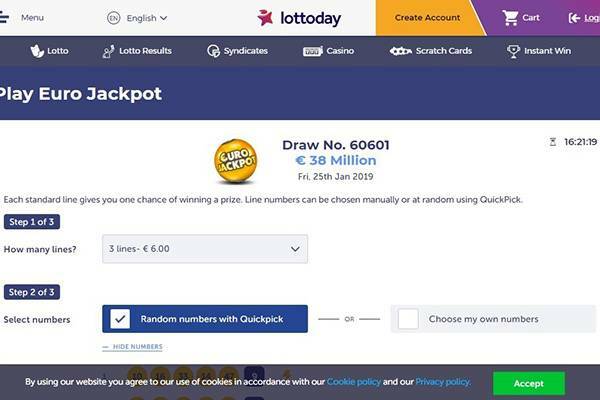 Lottoday.com is a platform where you can buy online lottery tickets from the major existing jackpots. The platform don’t have the biggest offers of lotteries or another kind of side games either. Also, payment methods are the most popular ones but not numerous. 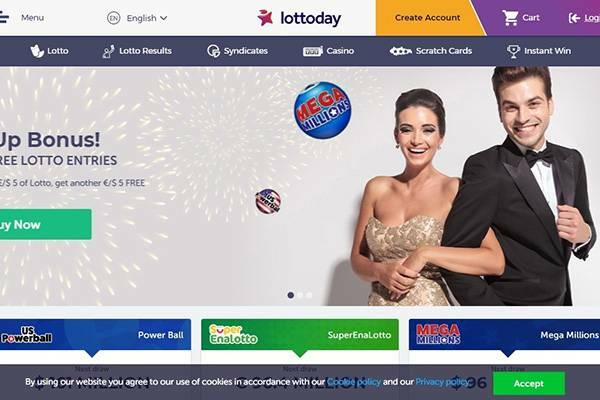 Lotto Day can be use with desktop , tablet and mobile devices and offer syndicate purchases. We give to LottoDay 3 of 5 points ranking. The site is really nice and easy, but still lacking many features and lotteries. Nice start for Lotto Day, we wish the will continue growing and improving the platform.